06-11-2015 • Categories: New release, News, Search! Textkernel has released version 3 of its semantic search & match software. The new release centers around two themes: a new scalable backend, and personalisation of semantic search behaviour; making sure you find what you are looking for. Textkernel’s development team has put a lot of effort into implementing a new scalable backend for Search! and Match!. While at first sight this might not seem like a major change, the new backend brings a lot of benefits. First of all it has become much easier to scale up projects. If you are planning to grow your candidate database, Search! is there to grow with you. Second, it offers more stability and availability, ensuring better uptimes. From the development point of view, it makes it easier to implement new features, so you can get upgrades faster. Search! is semantic search software that not only searches for the keywords you entered, but also includes synonyms and related terms. It lets you find what you mean, not just what you type. Search! 3 takes this another step further. It takes into account your own preferences and will let you find what you mean. When you search for a term, Search! will automatically suggest several related terms or synonyms. Users can now also add own synonyms to the list, making sure every search term is included that is relevant to the user. This new feature also allows users to create their own categories. Example: you want to search for candidates that worked at one of the big four accounting firms. You can now easily create your own list by entering a search term and adding your own synonyms. 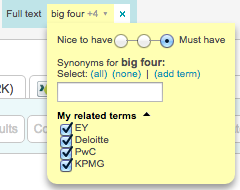 In this case to the search term big four you can add EY, Deloitte, PwC and KPMG. Search! offers all synonyms and related terms it knows. Depending on its configuration, either none of the related terms are included or all are included. With the new version, Search! can automatically remember which synonyms were selected for a term on a user level. Next time the user searches for this term, Search! will automatically include all of their previously selected keywords. In Search! you can create projects and save your searches and search results. Frequent Search! users may have many projects. This release enables easy searching and retrieving of these projects. You can sort them alphabetically or chronologically, for example your most recently created projects on top. You can also search by project name. You can now use query language not only in the large search box, but also the facet and tag cloud boxes. 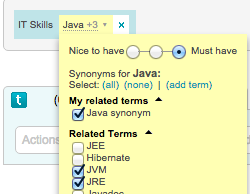 For example, if you type (java oracle) in the computer skills section, you will search for ‘java or oracle’. For the full list of available query language, visit the help page in Search!. With Search! you can easily discover suitable candidates in your own database and simultaneously search external sources such as professional networking sites and job boards. With this release, Indeed has been added as an external searcher in order for recruiters to also find relevant candidates in the Indeed candidate database. Would you like to know more about Search! or the new version? Please contact Textkernel.